UNITED STATES: The US wind industry is seeing a rise in interest from utilities looking to buy their products now that the production tax credit (PTC) has been extended, but a compressed timeline for accessing the incentive, through the late approval, adds risks for developers. 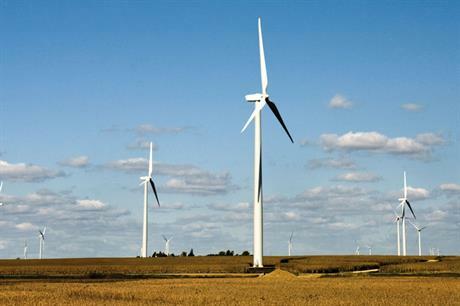 Minneapolis-based utility Xcel Energy was one of the first to take advantage of the PTC extension, announcing in February a new request for proposals (RFP) for up to 200MW of wind to take advantage of what it sees as a buyer's market. The utility is also planning an all-source RFP in Colorado that expects to attract wind bids. Xcel is very far ahead when it comes to meeting state renewable energy mandates in its service territory, but wants to continue its strategy of buying wind while the federal subsidy is in place, says Kurtis Haeger, Xcel's managing director of wholesale planning. "Certainly we continue to look for energy if it is at the right price," Haeger told February's Infocast Wind Power Finance and Investment Summit. Blake Nixon, president of Minnesota-based Geronimo Wind Energy, said he expected that other utilities would shortly follow suit. "Those we've talked to are coming back into the market in the next month or two with RFPs," he said. "This is the one opportunity they'll have with certainty that they can access low-cost wind without taking the Washington gamble again." However, to access the extended PTC, projects have to start construction by the end of this year and the process of soliciting bids and finalising the resulting power purchase agreements (PPA) takes time. "I do envision those RFPs resulting in contracts to be executed somewhere around the middle of the year and approved somewhere around the end of the third quarter," said Nixon. "So it is only in the nick of time." Ed Einowski, a partner at law firm Stoel Rives, said: "To go to a turbine supplier in October this year and commence negotiations and get a deal in place in time to meet the under-construction deadline, that's going to be very challenging." Einowski said that to meet the PTC deadline developers are likely to have to begin lining up their turbine supply and balance-of-plant agreements before PPAs are locked down. However, this forward-planning approach will expose the companies to potentially millions of dollars in penalties if something goes awry and they have to back out of development.